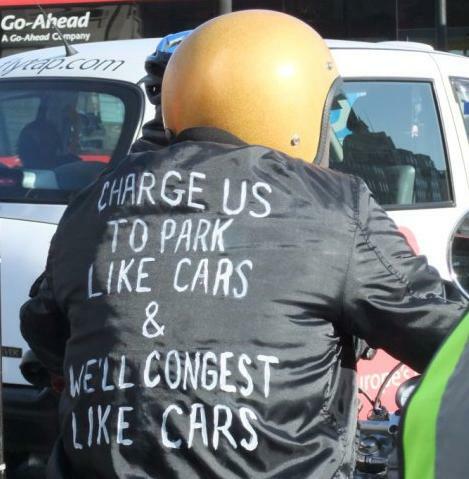 Hundreds of motorcyclists gridlocked London again this morning for the seventh week in a row in protest at a parking tax introduced by the Tories in Westminster. After David Cameron, Leader of the Conservative Party, had announced that, if elected, his party would scrap stealth taxes and refrain from introducing new ones, guess what, a new stealth tax on motorcycle parking was introduced by the Tories in Westminster. Similarly, Boris Johnson said, before being elected Mayor of London, that he would scrap bendy buses in the British capital. Has he actually done this? No, that’s another lie of the Tories. So can we actually trust the Conservative guys for telling us the truth about what they plan to do if elected on 6th May 2010? If you intend to vote Tory, you should ask yourself whether you think they are really going to implement the policies they propose, but the choice is obviously yours. While Boris Johnson has to date not kept his promise to get rid of the bendy buses in London, the good news is that they heavily help the bikers to gridlock London every Wednesday. 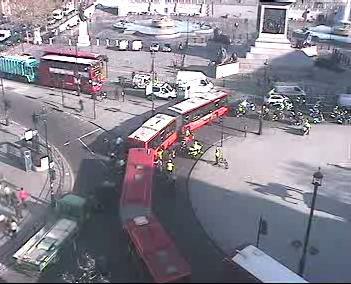 We were just amazed to see how many bendy buses were stuck in traffic around Trafalgar Square this morning and how much they helped the bikers to cause complete chaos on the roads and put their point across. So we say thank you to Boris for supporting the bikers so well in their campaign. After all, those bendy buses are doing a great job, aren’t they? Thousands of commuters again arrived late at work this morning as a result of being stuck in their cars and buses for hours. We met a few of them during the day who told us that they had to cancel business meetings because they were stuck in traffic jams. A couple of them even told us that they didn’t manage to get to work until noon. But who is to be blamed for this? Westminster Councillor Danny Chalkley is the man to blame. He’s the one who has chosen to ignore thousands of written objections sent to him and decided to impose a parking tax on motorcyclists without any justification other than that of bringing additional revenue to Westminster City Council. With £17 million invested in now failed Icelandic banks, £15 million wasted in an illegal CCTV system, £22 million budget overspend, potentially a £50 million fine as a result of parking firm ACPOA lodging a complaint against Westminster Council for acting “unlawfully and unfairly” during the recent parking enforcement contract bidding process, Councillor Chalkley feels the need to bring in an unwanted motorcycle parking tax that he claims to be making a £430,000 loss per annum. Well, as we say in French, “qui rira, rira le dernier”, in other words, we will soon find out who has the final word. Why not joining the bikers next Wednesday morning during their gathering in Central London causing gridlock and also on 1st and 5th May 2010 to leaflet Councillors Chalkley’s and Barrow’s wards to encourage their residents to vote these individuals out of office at the next elections on 6th May 2010? Don’t forget that it is Chalkley who has recently come up with ludicrous proposals to extend parking control hours in Westminster until midnight. Do you really want to be treated like cash cows for the next four years and beyond? If you don’t, then vote this man out, otherwise be prepared to keep your wallet open and see your money disappear without even noticing it. « Is there any difference between a French and a British motorcyclist?